Master Frederick Scott, 8th Dan, is founder of the Traditional Tang Soo Do International and Chief Instructor of Amkor Karate Institutes. 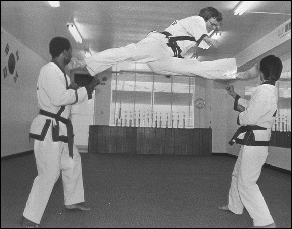 Master Scott began training in Tang Soo Do in 1972 and founded the Amkor Karate Institutes in 1977. Since then, six of his direct students, all of whom hold Master level rank, have established additional Amkor schools throughout the state of Pennsylvania. Currently Master Scott has affiliated schools in the United States, United Kingdom, South Africa, and Australia. Recognized both Nationally and Internationally as one of the leading American instructors of Traditional Tang Soo Do, Master Scott's achievements as a competitor, instructor and tournament promoter and organizer are well documented. Master Scott is a published author on the art of Tang Soo Do and has produced several television and internet events on the Martial Arts. Although Master Scott's teaching philosophy has always emphasized the preservation of Tang Soo Do as an art form, he believes traditional training can be enhanced and supplemented with sport competition. His unique blending of traditional training with competitive experiences has enabled his students to compete and win at the highest levels of both Korean and Japanese organizational competition at both the National and International levels. This very special methodology of teaching has given his students opportunities to travel abroad and have experiences that have enriched their lives in addition to earning respect worldwide for Traditional Tang Soo Do International and the Amkor Karate Institutes. Master Scott's expertise is also highly prized by professional athletes and has served as a consultant to the Philadelphia Flyers, the Philadelphia Phantoms, Philadelphia 76ers, and several NFL players. In addition to his work with athletes, he has also served as a consultant to the Disney Institute in the creation of a self-defense program for their state-of-the-art sports complex in Orlando, Florida and has taught Tang Soo Do at the University level at both Penn State and Neumann University. In August of 2004, Master Scott traveled to Athens, Greece, as a member of the NBC broadcast team broadcasting Olympic Tae Kwon Do competition back to the United States. While in the United States Army during the Vietnam War, he lived in Okinawa and has trained with many of the most knowledgeable Asian Masters in the world today. Master Scott trained and received his Tang Soo Do credentials from the highest ranking Moo Duk Kwan practitioners in the world, including Grandmaster Hwang Kee, Grandmaster Jae Chul Shin, Grandmaster Kang Uk Lee, and Grandmaster Andy Ah Po. In 2012 Master Scott was given special recognition as a senior consultant to the American Tang Soo Do Association and the United Tang Soo Do Congress as a senior consultant and promoted to 8th Dan by Grandmaster Richard Byrne. Over the years Master Scott has been an honored guest at many Okinawan, Japanese, and Chinese seminars and clinics taught by the highest authorities on these Martial Arts in the world. He has also served on the board of directors of several prominent Martial Arts organizations. Master Scott's recognizes Master Hyun Chul Hwang as the instructor who instructed him to technical maturity while a member of the United States Tang Soo Do Moo Duk Kwan Federation.